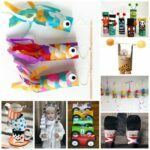 We adore Unicorn Crafts for Kids! 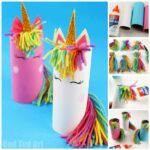 And today is no different.. as we have a go at making a fabulous and easy Toilet Paper Roll Unicorn Marionette or Unicorn Puppet. 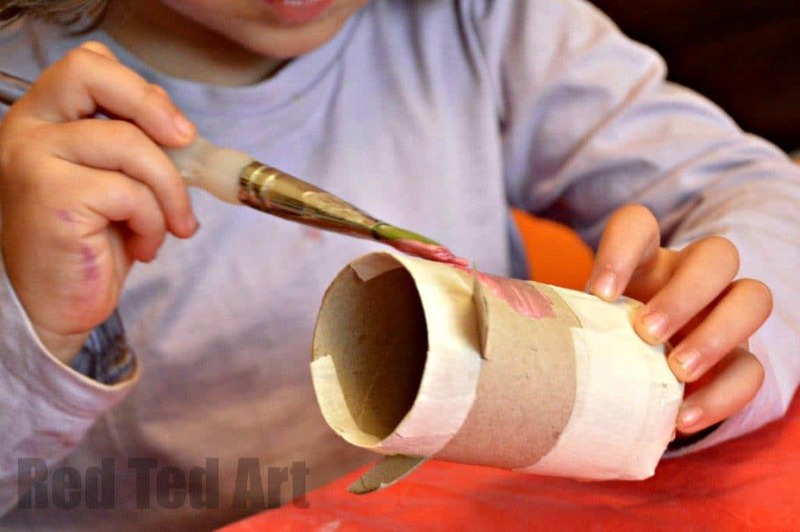 It is another addition to our fantastic and rather extensive list of cute and easy Toilet Paper Roll Crafts for kids! 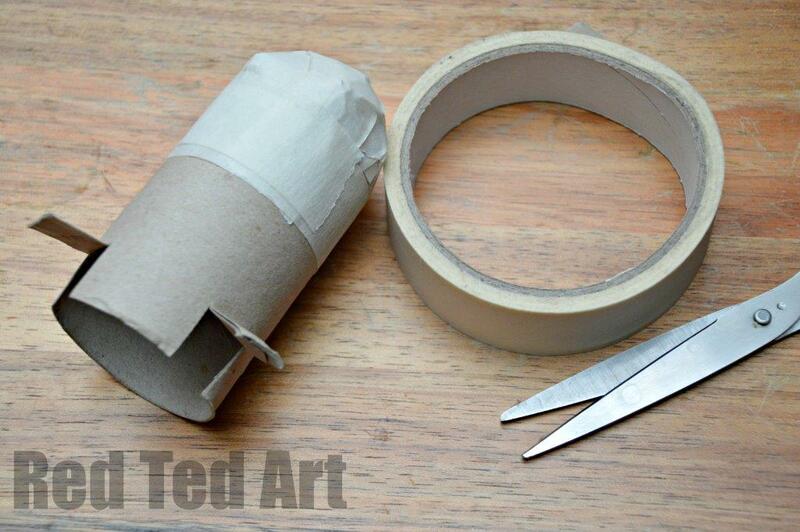 If you need to know what to make from toilet paper rolls, you have all the inspiratio in one place!! 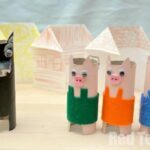 It has been quite some time since our last Toilet Paper Roll Marionette craft – we have made a Sausage Dog (which Pip Squeak ADORES), Autumn Birds and Toilet Paper Roll Giraffes in the past…. time for another one: Unicorns! As you can imagine, unicorns are pretty magical. And ever since the kids went on a “Unicorn Trail” at the Wilderness Festival this Summer, they are totally in awe of these magical beings. I thought…. wouldn’t a unicorn/ pegasus marionette be fabulous?? So.. of we we went and got crafty! 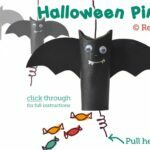 If you love DIY Puppets for Kids, we have a whole range of Printable Paper Puppets plus more Toilet Paper Roll Puppets for you to check out! 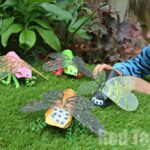 Have a good rummage around your recycling box and nature crafts box (if you have one!! 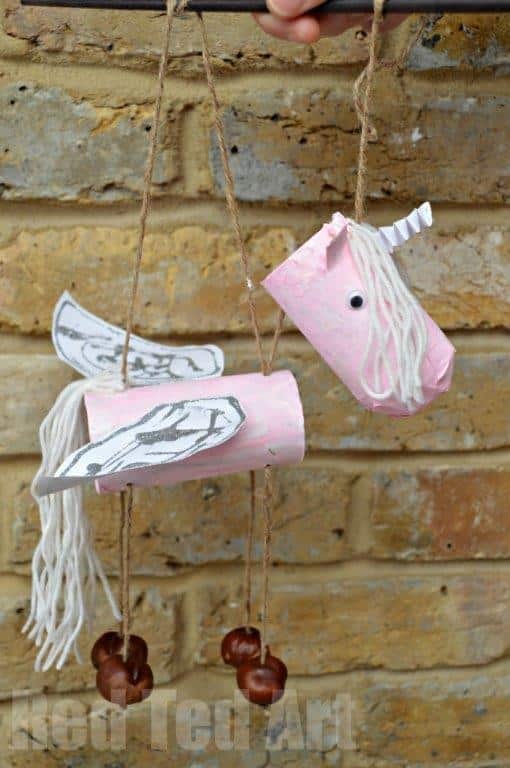 Teehee, if not, you must start one) for these basic materials need to make these adorable Unicorn Puppet! 1) We started by shaping the head. To be honest, I think a “giraffe” type head would have been fine too (i.e. nothing clever, just the loo roll), but you know us.. 3 years down the line and we thought shaping the head a little would be fun. We used the same technique as with the birds and the dog: in this instance we snipped 6 lines into one end of the loo roll – only about 1-2cm long. 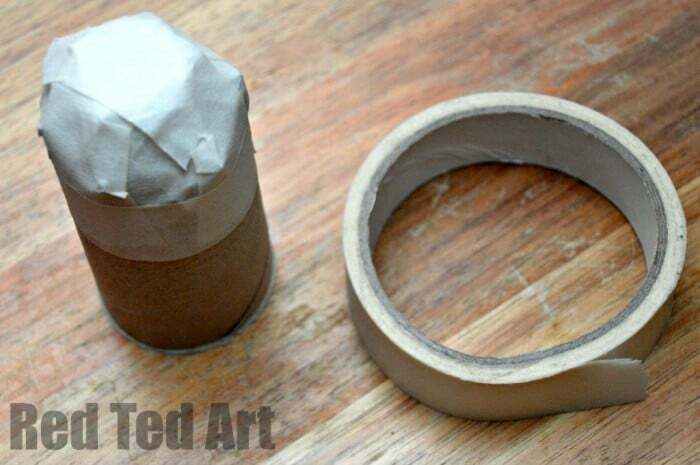 Then curled them over each other and secured with masking tape. So it is a shorter version of the bird beak. Then we covered the hole with more masking tape. It is important that you use masking tape, as you can paint over this. 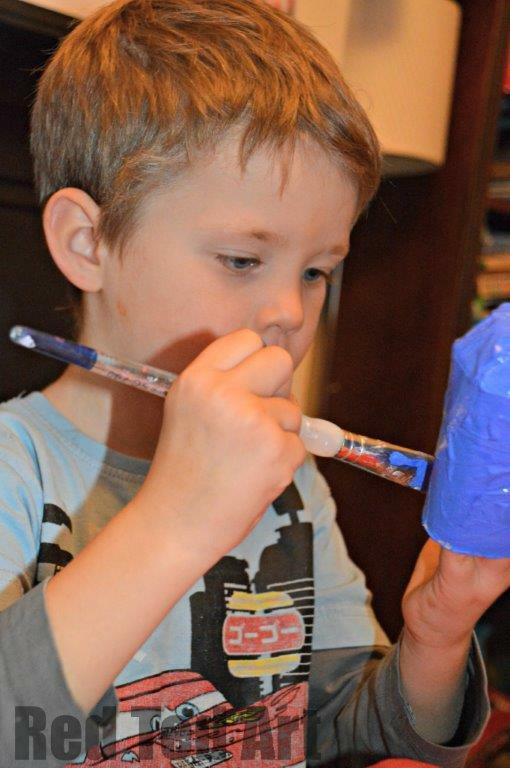 Ordinary tape will not “take” the paint. We also snipped out “two ears” that we then propped up. Again, we covered the resulting “hole” behind the Unicorn’s ears with more masking tape. 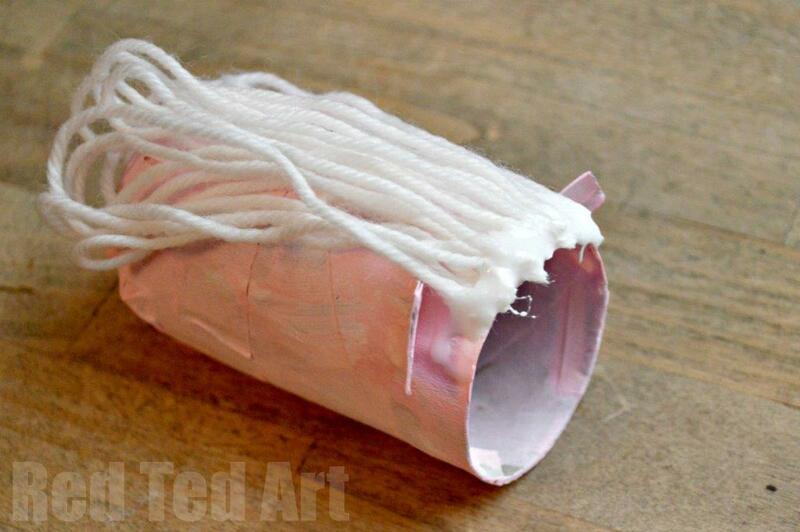 2) Paint your tp roll unicorns. Yes, Pip Squeak chose pink and yes Red Ted chose blue. I promise you, I had nothing to do with these colour choices. Let them dry. 3) Then we glued on some wool for the mane and tail. 4) Added some googly eyes. 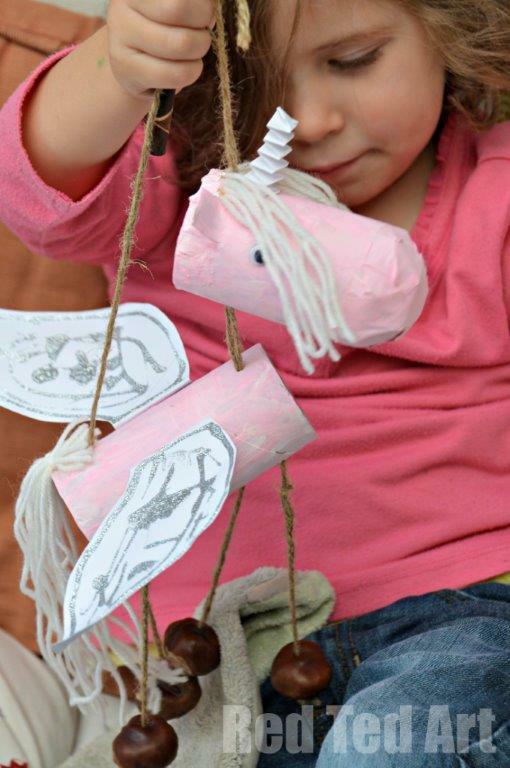 5) Made a little horn for the unicorn – instructions on how to fold this are are over at the Giraffe Marionette post! 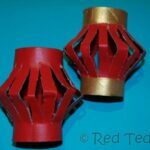 But all you need is two strips of paper folded into a “witches ladder”. 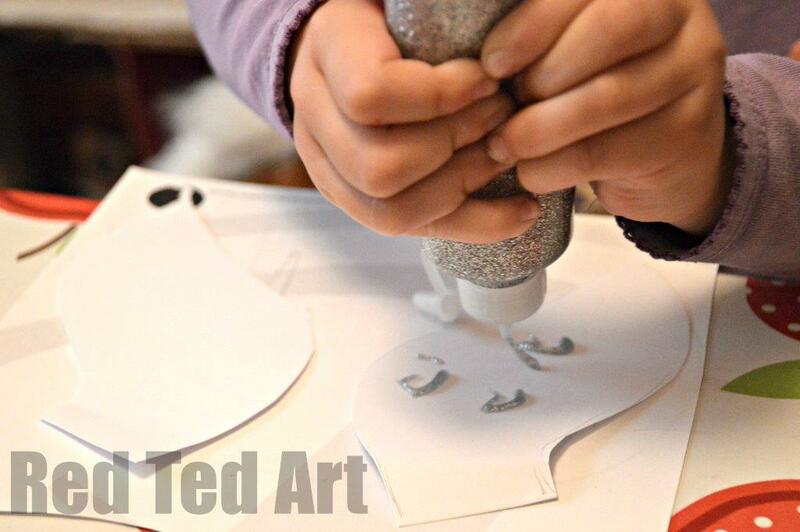 6) We then added some Pegasus wing: just a bit of thick paper or light card with lots of glitter! Once tried we stuck these on. First we made the legs – one long ish piece of string for each “set” of legs and 4 chestnuts. I used a skewer to pierce the chesnuts as per our Conker Game post. If your chestsnuts are VERY OLD, they may be quite tricky to pierce. Fresher ones are easier. If you don’t have chestnuts, some colourful bottle lids could look just as nice. We liked the “clip clopping sound that they make! We threaded the string through one chesnut, into the lower body of the horse, through the body and out again to make a second leg and then at the end of that a 2nd chesnut. Repeat for the hind legs. Connect the head with the body with a piece of string. Connect the top of the head to the stick with more string. Connect the body to the stick with two pieces of string – one coming located by the bottom of the neck (use the same hole) and one through a hole by the tail. DONE!!! Enjoy your beautiful Pegasus Unicorn Marionnet! Isn’t it magical? 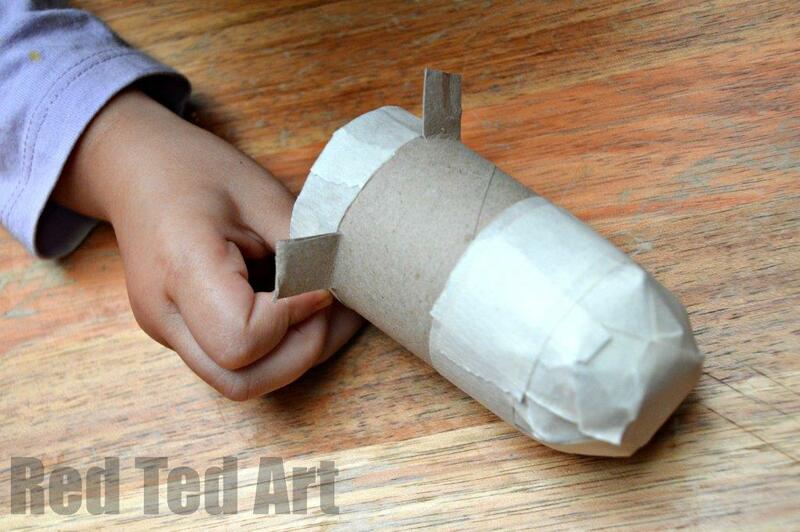 I do love how very versatile Toilet Paper Roll Crafts really are. 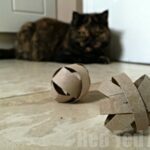 There are so many fantastic things you can make from this oh so humble craft material. 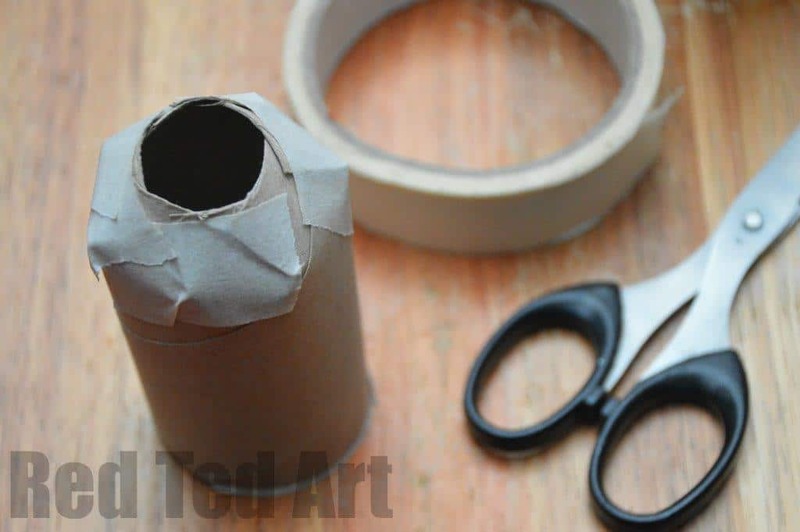 Why craft with toilet paper rolls? 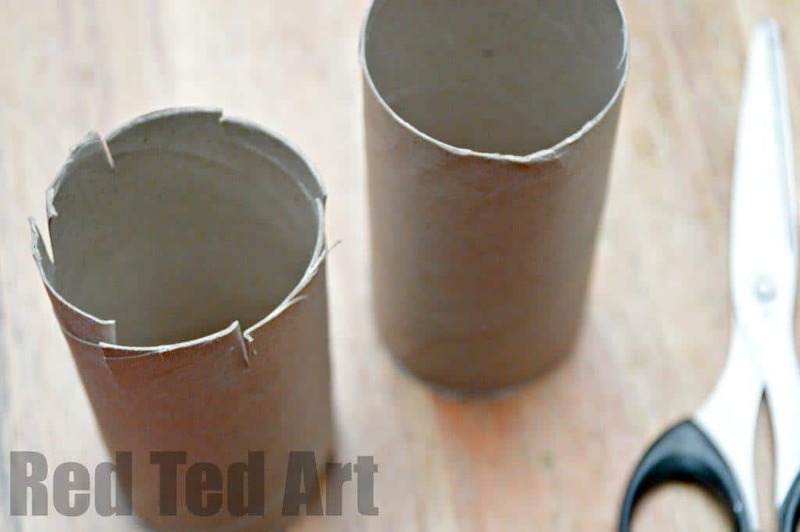 In short – because Toilet Paper Rolls are inexpensive, plentiful and surprisingly versatil. 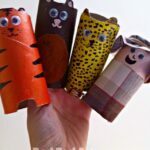 Just check out all our other Toilet Paper Roll Crafts for inspiration and ideas! Oh wow – thank you so much for featuring our site and we are so glad you enjoyed our project!! Yarn & Nail art is fun any time of the year – we’ve made them for fall, winter, spring – now we just need to make a summer one 🙂 If you and your little ones do make some yarn & nail art, we would LOVE to see!! Awww my pleasure and I loved it! Definitely want to give it a go Andrea!! Oh my goodness, your unicorn is absolutely adorable, Maggy! Awww thank you Jackie! Chuffed you like it! Oh I love it – look at those conker feet! The conkers make us really happy Pinkoddy, as they make a nice clip cloppity sound….. This a adorable but not for small children. It was quite difficult to make. Fun for kids to paint and all but stringing it all together was a nightmare. Yes, you are right, this is very much a collaborative project. Many of our projects are a like that. We work together on it and the kids do the bits they can. They help were they can and learn new skills along the way.